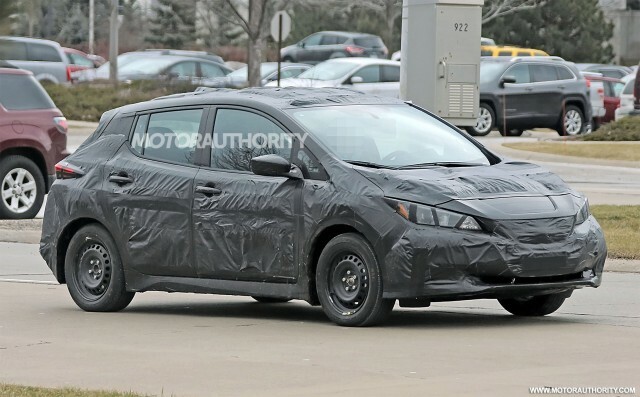 A prototype for the next-generation Nissan Leaf has just been spotted. The redesigned electric compact hatch is expected to debut later this year, as a 2018 model. Nissan should remedy this with the redesigned Leaf, though it’s not clear what the new range will be. Based on hints from Nissan executives, the range will likely be between 200 and 250 mi. The battery is expected to be a 60-kilowatt-hour lithium-ion unit with similar dimensions to the current Leaf’s 30-kwh unit. Our spy shots reveal a more conventional design for the Leaf, with influences clearly taken from Nissan’s IDS concept car unveiled at the 2015 Tokyo auto show. Signature Nissan styling cues include the V-Motion grille and floating roof. The size is about the same as the current model.